W hen deciding what type of tank to use when making wine, you’ll likely come across a few different palatable options. Each type of tank has its own unique benefits and drawbacks, so it’s important to do your research before you set out to buy just any type of tank. Your wine is its own unique blend, so the best way to honor your wine is to ensure that its vessel helps accentuate its flavors and is a productive member of the winemaking process. In order to decide which type is right for you, we’ve summarized below the most common types of tanks, along with information regarding temperature control, oxygen levels and regulation, tannins and flavor impacts, sanitation issues, and the likely costs for each tank. The most common of tanks, stainless steel vessels offer many benefits to the winemaking process. Not only is it fairly easy to regulate temperature in stainless steel tanks, but they are also known to be very easy to clean—and even perhaps, the easiest of all types—due to the smooth surfaces of the tanks. Sanitation is a large factor in the winemaking process, which makes this a very important factor. Stainless steel tanks are a common sight in wineries. 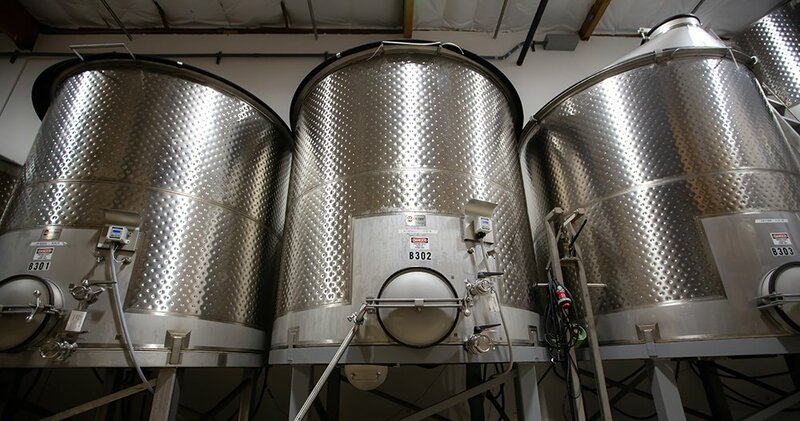 The properties of stainless steel make it a great fit for fermentation (and storage) tanks, and overall investment for your winery. These types of tanks are also cost effective, so if price is any consideration (which it normally is), then this could be a big factor in your fermentation vessel decision. Additionally, stainless steel tanks are generally produced locally, so you likely won’t have to search far and wide (and pay a significant shipping fee) for this type of product. Not only are they economical, but they are also known to be a solid investment. As a metal, stainless steel generally holds its value and can be easily sold as a used vessel, as they are so common and the inter nature of stainless steel maintains its condition over a long time. One thing to consider as this is being written is the current economic environment and the fact that even local producers of tanks purchase steel in bulk from China, where we are experiencing higher rates. In terms of tannin and flavor effects, this type of tank could be right for you if you don’t want to add any tannins or flavors to your already desirable wine. You can use this tank to focus and highlight the specific profiles of your fruit, knowing that the effects on the wine are due to your own winemaking decisions and not the fermentation mechanism. Lastly, the shape, taper, valve and door placement can vary by tank—essentially allowing you to produce a custom tank for you winemaking or fermentation goals. Since you will have this tank for a very long time, be sure to confirm that the vessel is the shape and taper that you’d wish before you make your purchase. 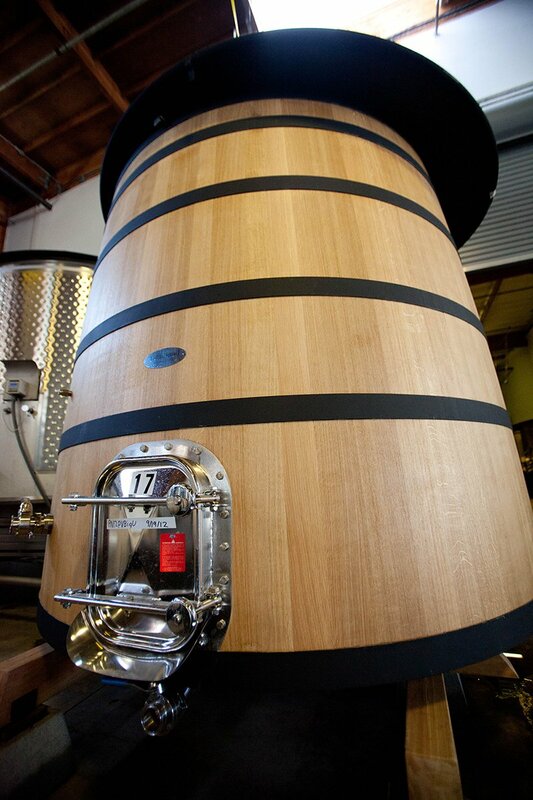 Wood tanks can be a nice addition to the winery, while also adding beneficial sensory properties to the wine. Like stainless steel tanks, wood tanks are also very common. However, there are many components of wood tanks that make them almost a different species than stainless steel tanks (Crush Brew). For example, wood tanks add tannin to wine, which generally produces a different texture, an oak-driven flavor and aroma—a profile sought after by many, particularly for red wines. Wood also has an insulating property that keeps fermentations warmer—this can be a good thing, but close temperature control must be monitored. Unlike stainless steel tanks, wood tanks are generally more difficult to clean and maintain. 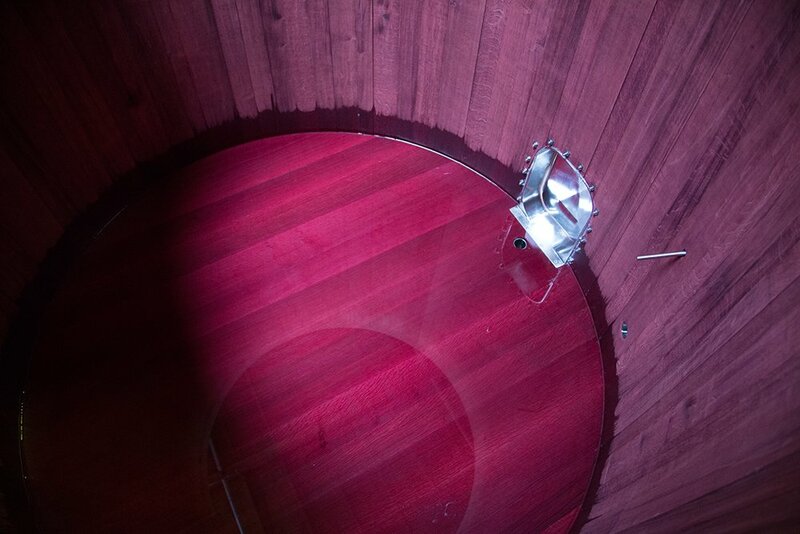 Since the surfaces of wood tanks are textured and porous, wine soaks inside of the wood. This can be detrimental, as tiny microbes can harbor within the grains of the wood, thus requiring that these vessels need constant time and attention as it pertains to the cleaning and storing process. This also goes for the color of the wine. A winemaker may consider that if your vessel is “a red wine tank once, it is always a red wine tank.” When storing wood tanks, you must both sanitize the tank and hydrate it so that it doesn’t dry out before you use it next. It’s also helpful to keep in mind, both financially and environmentally speaking, that wood tanks are used for decades, but if you are looking for the sensory impact of new wood, that will only be obtained within the first 2 to 3 years of use. Lastly, unlike stainless steel tanks, wood tanks are generally not produced locally, and the shapes of the tanks are generally cylindrical. Inside perspective of an oak fermentation tank. The interior of wood tanks require special care and maintenance, otherwise the porous surface of the wood can harbor unwanted microbes. 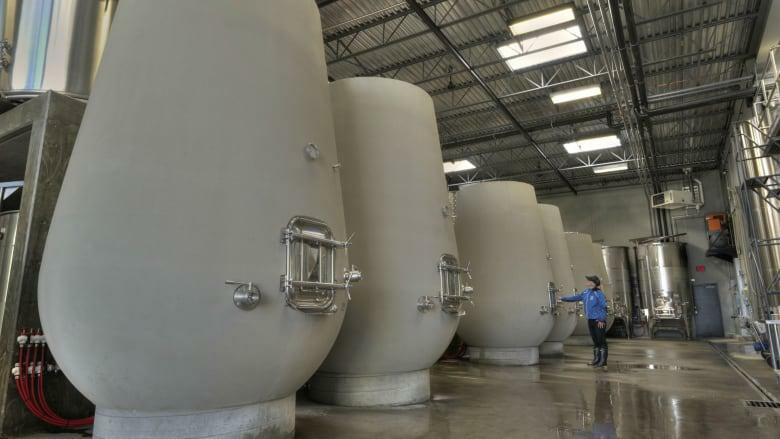 Concrete tanks are an unconventional, older type of winemaking material that has recently made a comeback in the United States (The Press Democrat). Although winemakers in Europe have been utilizing concrete to make wine for centuries, winemakers in the US are beginning to once again appreciate the mineralistic nature of concrete tanks and the gradual flow of oxygen into the wine. A unique property of concrete tanks is their porous nature, which allows small amounts of oxygen to enter the tank and the wine during the fermentation process. In terms of temperature, concrete slowly warms and also slowly cools to create a more gradual fermentation process. Another common benefit to using concrete tanks is to get a representation of the wine itself, and not added character from oak. This would make it comparable to stainless steel, but with a different perspective. (Seattle Magazine). However, due to the concrete tanks’ porous nature, sanitation can be quite difficult. A potential drawback to concrete tanks is the challenge of the wine pigment remaining in the concrete vessel and the ability to switch back and forth from red or white wine, similar to wood tanks. (Seattle Magazine). Another common drawback to using concrete tanks is the fact that the vessel can be cracked due to the temperature of the liquid inside during fermentation or cleaning. Like stainless steel tanks, the shape and taper can vary by tank, and because of the nature of concrete, there are many forms and varieties of concrete tanks now being produced. So it is important to think seriously about the shape and taper before making any purchase. In terms of price, concrete tanks can be on the more expensive side, and harder to sell as a used vessel. 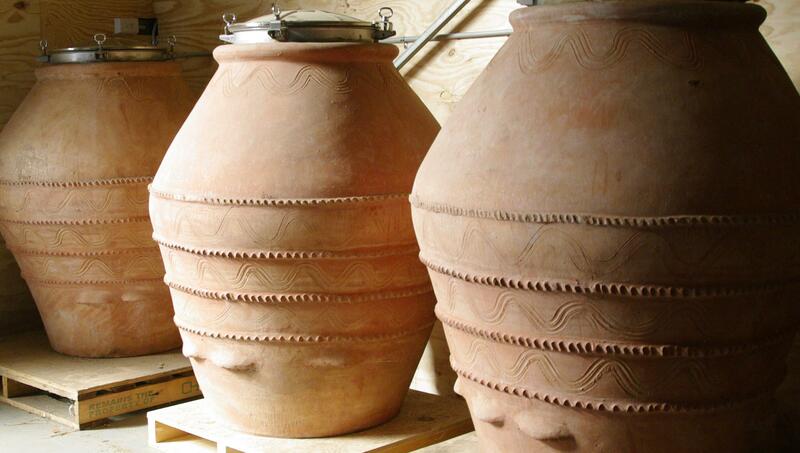 Another even older method of winemaking that has made a recent comeback is the use of amphora tanks (BK Wine Magazine). Throughout history, amphora tanks were made out of clay and buried in the ground during wine fermentation to protect the wine from oxidation. It is worth noting that while this was a way to protect wines from oxygen, if that is the main goal, there are other ways today for better oxygen protection (stainless steel, for example). They are regularly hailed as one of the most ancient and natural methods of winemaking. These tanks are made in a variety of different sizes. A drawback to using amphora tanks is the intensive labor required to produce wine this way, the limited ability to include doors and valves, and also the challenge of staving off oxidation (while this was a great method of preventing oxidation in the past, there are now other more secure methods). This method may limit the amount of wine you’re able to produce and labor fees may be high. Furthermore, generally there is a very small market for these types of tanks in today’s modern world, but it is always helpful to see where we’ve been before you decide where you may want to go. In conclusion, there are great options of fermentation vessels to choose from when producing wine, but depending on the various components of each type of vessel, there will be one that best suits you and your wine. To ultimately choose what type of tank you’ll trust your wine to ferment within, it could be helpful to make a list of priorities for both production and wine taste and then find your best vessel from there, and even to make a sketch of the tank and accessories you would like before contacting your supplier. © 2019 Gravity Wine House. All rights reserved. Website Design by ChelseaMcKenna.com. Website Development by HCreativeMedia.com.